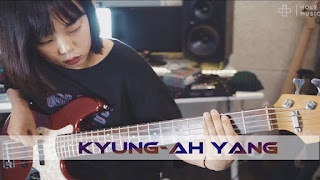 Here’s a Fender Deluxe Jazz Bass V. Kyung-ah Yang the bass player played through two different style, finger and slap style. In this particular bass, the modified electronics were installed. The modificiation enhances the conductivity of the wires and the clarity of the tone. Holy One Music regularly stocks Fender Bass Guitars. We guarantee to all our customers to get the instruments with the best sound and playability.